- Messi has scored more goals (29), more goals from outside the box (7) and more direct free-kick goals (4) than any other player in the top five European leagues this season. - Barcelona are unbeaten in their last 16 LaLiga matches (W13 D3), the best current run in the competition. - Only Cristiano Ronaldo (34) has scored more hat-tricks than Messi (33) in LaLiga history. - Barca have scored more goals from set-pieces than any other side in LaLiga this season (18 goals). - Suarez is the third LaLiga player to record double figures for both goals (21) and assists (10) this season in all comps, after Messi (39 & 18) and Pablo Sarabia (19 & 11). 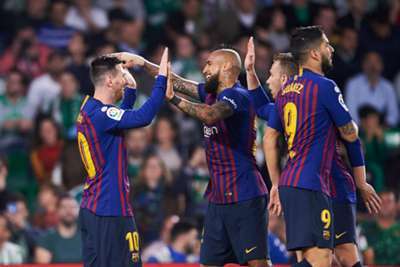 - This was the lowest possession figure that Barcelona have had in a single LaLiga match since 2004-05 (43.9%).